Here's everything you need to know about Pokemon Let's Go Pikachu and Pokemon Let's Go Eevee, including the release date, Alolan Pokemon, and the new Pokeball Plus. 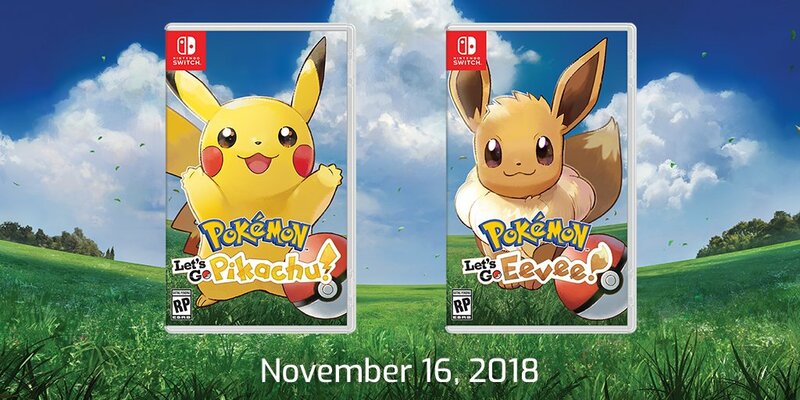 Pokemon Let's Go comes in two versions: One for Pikachu, and one for Eevee. In this complete guide to the latest entry in the Pokemon franchise, we'll be detailing everything you need to know about both versions of the Nintendo Switch game, including our review, the final release date, gameplay details, and much more. Pokemon Let's Go Pikachu and Eevee are now out in the wild, and we've spent our fair share of time with both versions of the game. For our full thoughts in detail, head over to our Pokemon Let's Go Pikachu and Eevee review. The Pokemon Company first revealed Pokemon Let’s Go Pikachu and Pokemon Let’s Go Eevee on May 29, during a presentation held with Nintendo in Japan. It was at this event that we also got the release date of November 16, 2018 for both titles, releasing worldwide throughout Japan and Western regions simultaneously. Pokemon: Let's Go Pikachu and Eevee. Just below, you can find a detailed list of our individual guides to Pokemon Let's Go Pikachu and Eevee. You can find pages on how to make excellent throws, how to find Charmander and Squirtle, and much more. The Pokemon Company Twitter account revealed after the presentation that there would be brand new Pokemon featured in Pokemon Let’s Go Pikachu and Eevee. Although we don’t yet know the elusive new Pokemon that will be featured in both games, we do know that there will be Alolan Pokemon featured throughout both titles. Both games will feature the original 151 Pokemon, but some Alolan Pokemon will also be present. For more on what pokemon you'll be able to find in Pokemon Let's Go Pikachu and Eevee, head here. Another new detail is that both Pokemon Let’s Go Pikachu and Pokemon Let’s Go Eevee are both based on Pokemon Yellow. There was originally a rumor that the core Pokemon RPG title in the works for the Nintendo Switch was to be a remake of Pokemon Yellow, but it looks like both these new games are taking that role instead. Both games are also set in the Kanto region, following on from Pokemon Yellow. On September 10th, 2018, Nintendo announced plans to release a Limited Edition Pokemon Switch bundle to celebrate the launch of Let's Go Pikachu and Let's Go Eevee in November. 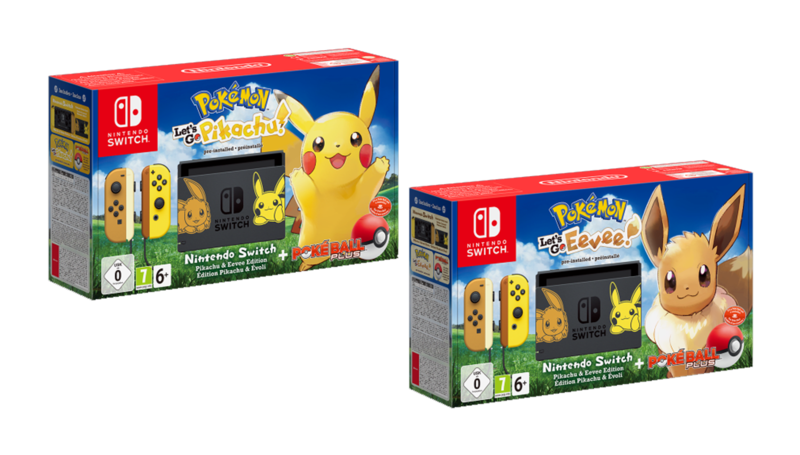 The Pokemon Switch bundle comes with a pre-installed copy of either Let's Go Pikachu or Let's Go Eevee, a yellow and brown pair of exclusive Joy-Cons, an exclusive Switch console backplate design, an exclusive Switch dock, and the Poke Ball Plus controller. The set releases alongside the games in November and is set to cost $399 in the US and £340 in the UK. You can pre-order one via the links below. Then there’s also the new Pokeball Plus feature. You can see the new peripheral just below, which lets you capture Pokemon by performing a throwing motion. This new peripheral will be releasing on November 16, so you'll be able to pick it up on the same day as both new games for the Nintendo Switch. Head elsewhere for a full breakdown of Poke Ball Plus, including battery life, specs and more. Much like other Pokemon games before it, Pokemon Let's GO will feature exclusive pokemon. What we mean by this is that each version - Pikachu or Eevee, will have pokemon that you can only catch in that version. Some of the pokemon involved include Oddish, Sandshrew, Growlithe, which will only appear in Let's GO Pikachu. Vulpix, Meowth, Bellsprout will only be available in Let's GO Eevee. You can always trade these pokemon with a friend though, so don't worry about not being able to fill your Pokedex. That completes our Pokemon Let’s Go Pikachu and Eevee guide, but keep an eye on this page, as we’ll be updating it with any additional information that Nintendo or the Pokemon Company releases over the coming months.